When you come to a dead end in an ancestor line, explore sideways. There could be clues hidden in the records or sources of those collateral relatives. Here’s what happened to me. I didn’t know much about a brother of my g-grandpa. But I had noticed there was another Ancestry subscriber who had him in her tree. So I contacted her through Ancestry’s messaging system. Not only was she able to provide me with more dates, sources, and photos, she pointed me towards a book one of her ancestors had written. This idea was shelved for a few months, until she wrote me again and said she had located a copy of it for sale online. I snapped it up immediately. 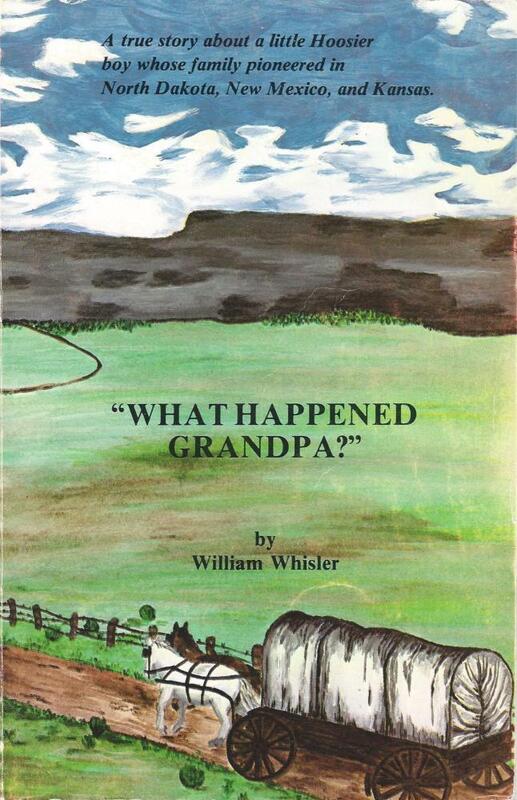 What Happened, Grandpa? A true story about a little Hoosier boy whose family pioneered in North Dakota, New Mexico, and Kansas. When it arrived I sat down with it, cradling it like a baby. Here were stories of MY relatives, written 30 years ago by the brother-in-law of my Grand Uncle about his early years in the early 20th century. So it covered my Grand Aunt also. How cool was that? I could see the land taking shape in my mind as I continued to read. I agonized with the family as they encountered various trials and tribulations. I rejoiced with them over the new babies, grieved with them as they lost their elders or their crops were ruined. Their pioneer spirit stood out in every chapter. I cheered with them after trying various homesteading spots in different States, they came back to where they started. Back to their friends and family. And I felt the warmth and love as they were welcomed back into the fold. I also saw their strong faith in God. They were Dunkards. I did not know that. This is why I do genealogy. To me, it’s not about collecting names. It’s not even about putting dates with those names, or collecting records and sources, altho those are important. It’s about getting to know your ancestors. Really getting to know them. That’s called “putting flesh on the bones.” What made them tick? What were their goals? Where did they get their motivation? What made them move west? And then farther West? What made some stay put? So if you’ve run into a dead-end, don’t give up. That big break-through could be off to the side, in those collateral relatives. Hunt, search, look – contact others. You never know what you might find until you try.